I gradually collected a few photographs of interesting engines, on my teenage trips to Altkloster station. 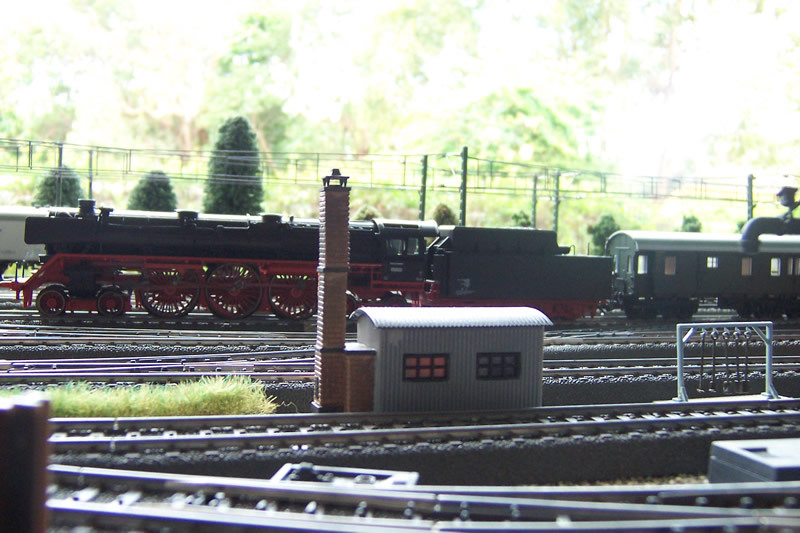 Here is 05 003, an engine which was originally built to an innovative design of reverse boiler, with windscreened cab in front, and pressurised powdered coal from the towed tender to the firebox. Many years ago, it was converted to a normal configuration, but it still awes the beholder, with massive 2.3m driving wheels. It has 3 cylinder propulsion, and a 4-6-4 wheel arrangement as with the American "Hudson" locomotives, and there were only 3 engines in this class. 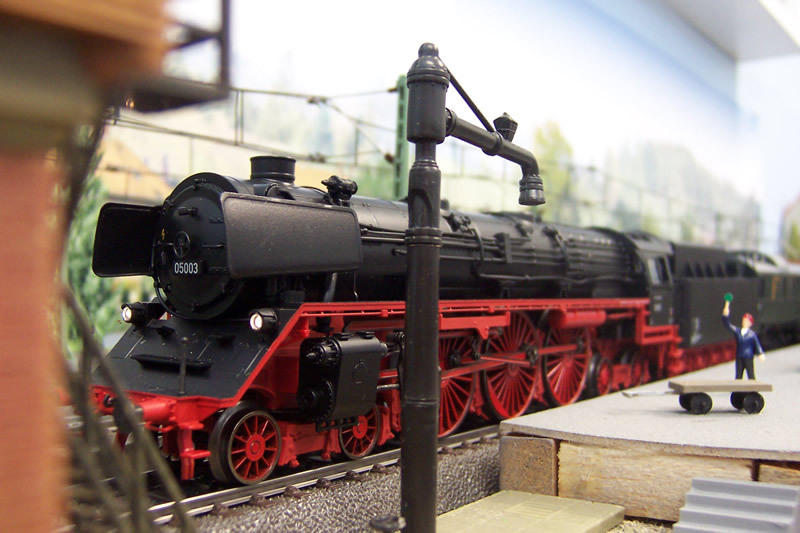 The Maerklin model 39050, especially produced in 2007 as an Insider Club model, replicates the engine beautifully. The class 05 locomotives were equipped with Witte smoke deflectors and inductive signaling equipment; this meant they were equipped for speeds of 175 km/h / 109 mph. However, the general maximum speed for all trains on the DB was still 130 km/h / 81 mph. In this purely utilitarian form these locomotives showed the belated high point in the development of the standard design locomotives and at the same time the crowning finish. Until 1957 the class 05 locomotives represented the absolute stars in German long distance passenger service - only the E 19 electrics could keep up with them. 05 003 is about to leave for Heidelburg. The station staff were quite used to my hanging around with a camera, as I acted safely. My actions would not be tolerated in the 21st century. Another view of the 05 class, this time at the eastern approach to Altkloster from the engine servicing area. Around 1952. 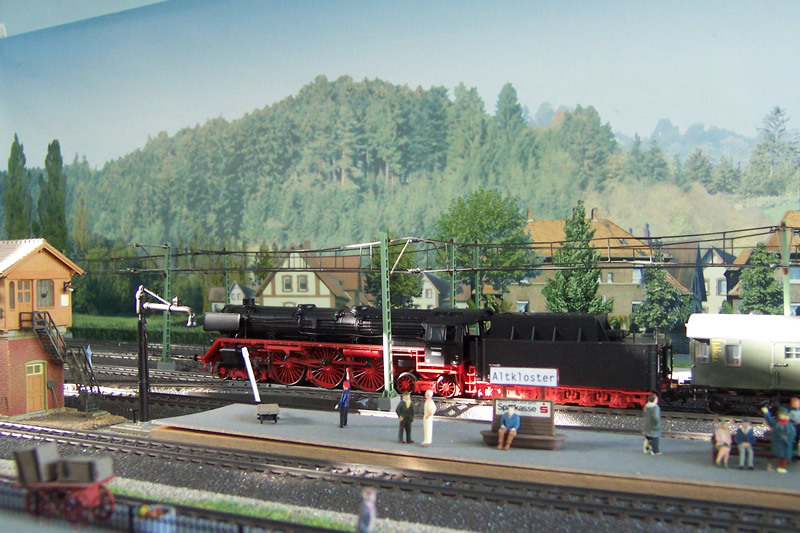 This model is Maerklin 39050, and shows very well, the detailed framework, wheels, and cylinder gear of the engine. In 1951, the same engine is here shown passing westward through Altkloster on the relief line, the now setting sun highlighting the train. It is a parcels and mail train, and a stop was not required.